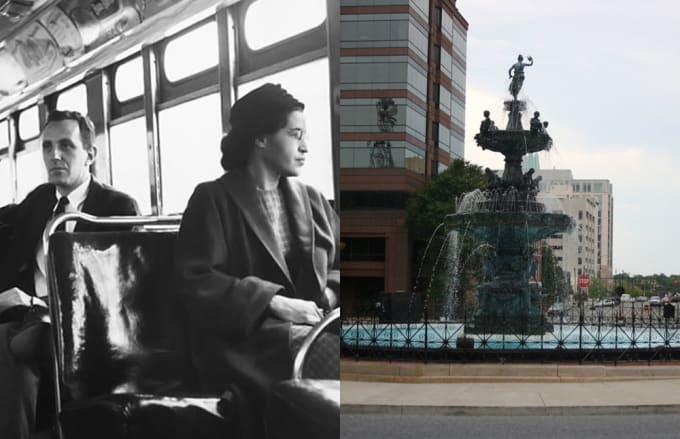 Location: Court Square, Montgomery, Ala.
On the evening of December 1, 1955, Rosa Parks boarded the Cleveland Avenue Bus at Court Square, all the way at the end of Dexter Avenue in Montgomery. The first four rows of the city's buses were reserved for whites, the rear for "coloreds." After a long day of work at the Montgomery Fair department store, Parks sat in the front of the bus. Parks was no stranger to trouble on the city buses. In 1943, she had been left standing in the rain after an impatient driver left without her. Now, 12 years later, here was that same driver—James L. Blake—demanding that she and three other black passengers move to the back of the bus to make room for white passengers. Parks wouldn't budge. Her decision, an act of civil disobedience, led to her arrest. This moment triggered the Montgomery Bus Boycott, which began the same day as her trial. The bus stop where Parks waited on that day in December can be found inside the Court Square Historic District, also part of the National Register of Historic Places. A historic marker with a message paying homage to Parks sits in front of the Central Bank Building, the exact spot where she helped set progress into motion.